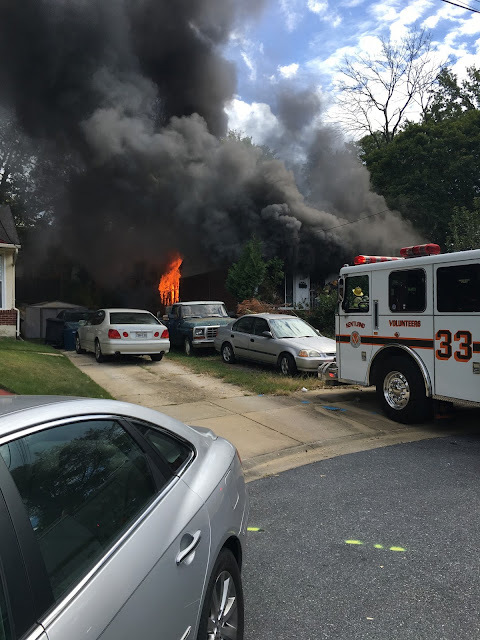 A Landover woman was rescued from her burning home by firefighters this afternoon. Just before 2:00 pm Public Safety Communications received several 911 calls from residents reporting a house on fire in the 6400 block of Country Club Court. One of the 911 callers told the call taker that someone was still inside the house. This information was relayed to responding firefighters by dispatchers. Firefighters arrived at the 1-½ story, with basement, single family home with heavy smoke and fire showing. First arriving firefighters initiated an aggressive interior attack on the fire with a simultaneous search for the trapped occupant. Within a short period of time an adult female was located inside and quickly removed from the house as other firefighters continued to extinguish the fire. The adult female was suffering from burn and smoke inhalation injuries and was transported by medics to a Burn Unit. She is listed in Critical Condition. The fire was extinguished within 20 minutes of arrival and no additional injuries were reported. Firefighters from Kentland, Bladensburg, Chapel Oaks and St. Joes were among the first arriving units. Personnel from the County Office of the Fire Marshal have initiated a cause and origin investigation and their work is ongoing. Fire Investigators will provide information on the cause and origin, estimated fire loss and if the house was equipped with a smoke alarm and if it was operational or not. Firefighters will return to the same Landover community tomorrow morning to check smoke alarms and talk with neighbors about the fire and status of the injured female. This is what our Department refers to as a Post Neighborhood Intervention Program (PINIP). Whenever a significant fire occurs or fire related injury firefighters return within 24 hours to talk with neighbors and check smoke alarms. If a home is found without a working smoke alarm, a new 10-year smoke alarm will be installed for them, free of charge. County residents can also call 311 and ask for this same service. County Law requires a working 10-year smoke alarm on every level of your home. One should be installed just outside of sleeping areas. The Fire/EMS Department recommends sleeping with your bedroom door closed and a working smoke alarm installed in every bedroom. If you have a natural gas service, a fireplace or an attached garage you are also required by law to have a carbon monoxide alarm on every level of your home. Heavy smoke and fire can be seen coming from the house on Country Club Court in Landover. The adult female occupant was rescued from the house a short time after this image was captured.